I'll leave this old site up for awhile, but please visit the new site. Remember to bookmark, and all. I have a long day at the parish ahead, but I hope to have Neil on board with WordPress very soon. A happier story can be told more briefly. In both cases the intensity of the experience, one of misery, the other delight, had made a little time seem long. Now take that farther, beyond the ultimate. Beyond time we slip the chains of duration. Our relationships are realised perfectly. We may, of course, choose that state of isolated misery we call Hell. But those who choose otherwise are in Paradise, loving God and in God, embracing everyone and rejoicing in those who are dearest to them. A preoccupation with the logistics of the afterlife is unattractive and occasionally dangerous. The Gospel of John (xiv, 2) is succinct and liberating: “In My Father’s house are many mansions.” Reinhold Niebuhr interpreted it beautifully when he said it was unwise “to claim any knowledge of either the furniture of Heaven or the temperature of Hell”. 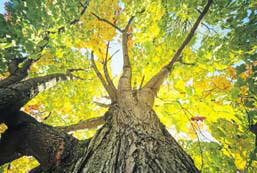 Belief in the afterlife encourages us to live now, and to live for others now. It means not living under a pressure to please but rather out of the environment of generosity where the gifts are such as unite rather than creating a climate of competition. There is nothing “automatic” about life after death. Eternal life is a gift from God, as are the blessings that surround us. Life after death begins here and now with the corollary of the offer of healing and peace made to all humankind in Christ. For this reason, the Church sees its mission as the tireless pursuit of reconciliation in the world and justice for all humankind. Vatican II's emphasis on the importance of the Liturgy of the Word: Sacred scripture is of the greatest importance in the celebration of the liturgy. For it is from scripture that lessons are read and explained in the homily, and psalms are sung; the prayers, collects, and liturgical songs are scriptural in their inspiration and their force, and it is from the scriptures that actions and signs derive their meaning. Thus to achieve the restoration, progress, and adaptation of the sacred liturgy, it is essential to promote that warm and living love for scripture to which the venerable tradition of both eastern and western rites gives testimony. "Of the greatest importance" is an important phrase of which to be mindful. 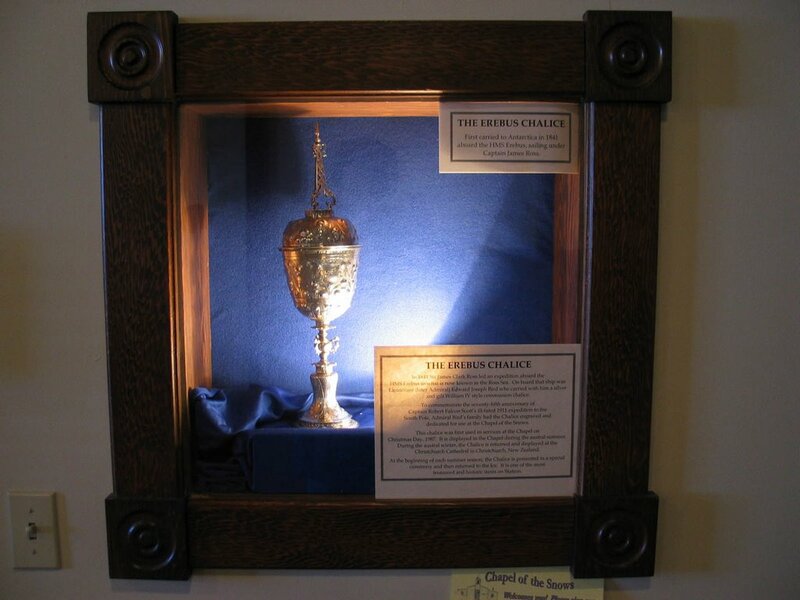 It underscores the council's intent to enrich the development and celebration of liturgy, and I stress, not to create or recreate an inherent hierarchy of Christ's presences. It would be inappropriate and beyond the spirit of worship to emphasize one or some to the detriment of others. All encounters with Christ--sacrament, Word, gathered assembly, presiding minister, the poor, as well as symbols and images of devotion--all of them are significant. They are not in competition. And the interior from the choir loft. The clutter in front of the altar is from last week's diocesan jubilee event at a school Mass: 50 cans of food from every classroom on the 50th day of school in the 50th year of the merged dioceses. 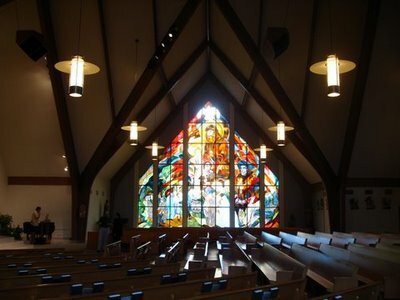 Here's an interior looking toward the south window. You can see our patron in the right third of the window. A little tougher to make out is the carpenter Joseph with young Jesus in the upper portion. Sacraments are portrayed in the bottom section. This image shows a bit of the northern Mary window. My favorite quiz is to ask a child (or adult) to discern as many of the mysteries of the rosary as she or he can. You might not be able to, but this gives you an idea of where I am on weekends. It's a nice church. Better than it was when it was built. It has its little problems. And a few big ones. 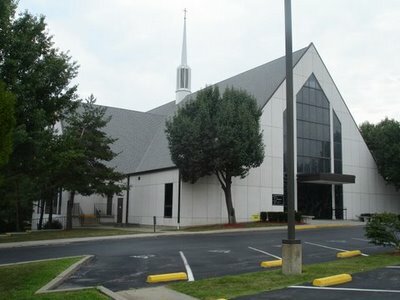 But I've grown very accustomed to the building and the people who come to worship in it. I have the software downloaded and the new Catholic Sensibility site up, but I can't figure out how to make WordPress do what I want it to do. Ack. Maybe another day. Blogger seems to be regurgitating all the pretty pictures I posted this morning, so the Big Switch will likely be put off till after next Monday's neighborhood leaf collection. And I still have to confer with my collaborator Neil to get his input. After that, it will be sorting and sifting through over 2,000 posts to categorize and make my Vatican II series easily accessible for theology geeks. Meanwhile, I've upgraded the links on the left to include Kathy and Gavin, two fine people with blogs worth visiting and visiting often. And a few Mars sites under Cassini. And in other neighborhood news, somebody should inform my two oak trees that it's okay to drop their leaves now. They're a nice mellow yellow-brown. Not as spectacular as maples, but not trunk-ugly either. My driveway is full of ground acorns. If the leaves would follow, my neighborhood association would appreciate it. Last two winters, the dang trees kept many of their leaves till spring. Talk about herneneutic of obstruction. All Souls: Good, Bad, Ugly, Etc. We had a good experience with a parish novelty last night: an evening Mass on All Souls with a reception following. We've always invited next-of-kin to our morning Mass and had coffee and rolls afterward. Our new pastor Father Don was receptive to adding an extra Mass. A handful of the fifty families attended, plus a larger handful of parishioners. We had more attend last night (94) than All Saint's Eve (56) which was encouraging. The pastor read the names of the parish deceased as family members brought a votive candle to place on the steps in front of the altar. (Violation of SC 23? You tell me.) Amy started a "What's Up" post for All Saints and All Souls, and this other post dovetailed off it. Where ever you find this kind of nonsense - and it is nonsense - you'll find a disdain for the "hierarchical" church, tradition, and rules. Chances are very good that you'll find a lot of talk simply about "Gospel values" and maybe, as they attempt to justify their liturgical stylings, a vague appeal to Early Christianity. You know, when it was all just a supper n' stuff. I can tell you that this Costume Mass would fly with no liturgist colleague I know. In fact, it's more likely to be retold over a beer or in a convention hall with a lot of snickers--not unlike St Blog's commentariat, to be honest. It's far more likely this event was dreamed up by someone steeped in the pseudo-liturgical catechesis front. That said, traditionalists don't always give hierarchy, tradition, and rules a free pass either. That sound tradition may be retained, and yet the way remain open to legitimate progress careful investigation is always to be made into each part of the liturgy which is to be revised. This investigation should be theological, historical, and pastoral. Hindsight might tell us that liturgical investigation was somewhat rushed after the council. Others would argue this liturgical examination was going on for decades prior to Vatican II. Also the general laws governing the structure and meaning of the liturgy must be studied in conjunction with the experience derived from recent liturgical reforms and from the indults conceded to various places. Finally, there must be no innovations unless the good of the Church genuinely and certainly requires them; and care must be taken that any new forms adopted should in some way grow organically from forms already existing. 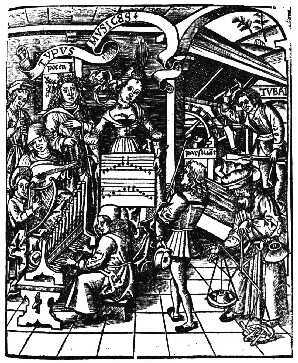 Sacrosanctum Concilium's sole reference to organic development of liturgical innovation. It references organic growth as a desirable ("should") but not an absolute ("must"). As far as possible, notable differences between the rites used in adjacent regions must be carefully avoided. I don't know what the council bishops would make of the present-day liturgical splintering, especially the use of the 1962 Rite, but not exclusively. Comments? A pastor has to hire a competent professional he can trust, who is close to agreement with him in pastoral and theological philosophy. Then let go. Aside from that, priests can do a lot of familiarize themselves with music, even if their seminary training was deficient. I would suggest some of these: - Attend choral concerts in your area. Listen to the best of church groups and community chorales and get a sense of what a real music director might accomplish in your parish. Invite the choir director to join you and talk about church music in a friendly way over a beer or a coffee after the performance. - Listen to lots of music. - Attend an occasional choir rehearsal and sing with the people. Get a sense of how your music director works with folks and get a better sense of how choir members see the church, pray in it, or what their challenges might be in doing so. 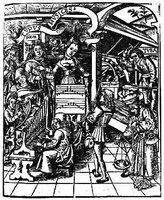 - Encourage organists--your own or someone else--to give lessons on the parish instrument. 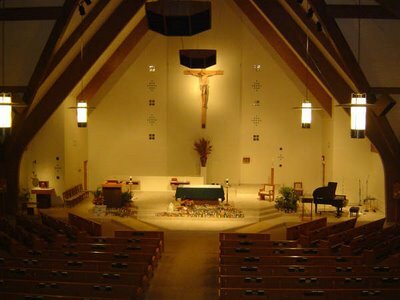 - Host a concert every now and then, or maybe gather a group of parishioners to start a regular concert series. - Provide a generous budget for your musicians to broaden their skills. - Ask for an occasional voice lesson. It will help your singing voice, but you can also apply the physical principles you learn to your speaking voice. You'll become a better homilist through a stronger set of physical skills. Regular voice lessons would be a great idea if you regularly chant the prayers of the Mass, but a "consultation" once or twice a year can be very helpful, especially if you schedule it just before the Easter Vigil and Christmas. Any other suggestions from the gallery? 1. Regulation of the sacred liturgy depends solely on the authority of the Church, that is, on the Apostolic See and, as laws may determine, on the bishop. 3. Therefore no other person, even if he be a priest, may add, remove, or change anything in the liturgy on his own authority. The third norm is often quoted, but the full context is seen here. The Vatican regulates the Roman Rite, but bishops have a role to do this also, within canon and liturgical law. 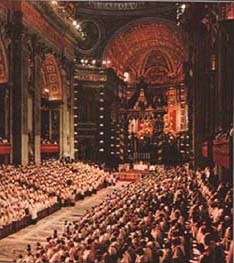 Bishops' conferences are the third and final source of liturgical regulation. Obviously not priests or lay people. I've seen norm 3 abused as a beating stick. There are legitimate options given in the Roman Rite, and priests and lay people can often make use of them. Such options are indeed "part" of the liturgy. That said, some crazy things have gone on and continue to be imposed on lay people with regard to liturgy. I've often wondered about ministry in Antarctica. Do the various bases have chaplains? How are they staffed? Who's responsible? Nancy Frazier O'Brien's CNS feature story profiles Father John Harrison of the New Zealand diocese of Dunedin, who recently flew to McMurdo Station for his fifth tour as chaplain. The outpost on Ross Island, seen here on the left, houses more than a thousand researchers and support staff each Antarctic summer from October to February. 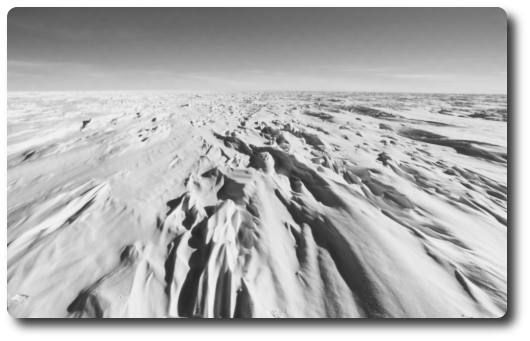 Father Harrison reflects: "When you fly into the South Pole, you realize that nearly all you're looking at no human being has ever set foot on.It's a real reflective time, when you can't help but focus on God and creation." "As the construction of the buildings at McMurdo progressed, a mysterious pile of lumber, planks, nails, Quonset hut sections, and assorted materials began to accumulate on a knoll overlooking the camp. Before the main camp was finished a tidy neat church with a steeple was to stand on a ridge overlooking the camp. Later it even had a bell, procured from a small gasoline tanker." A real bell: that's a plus. 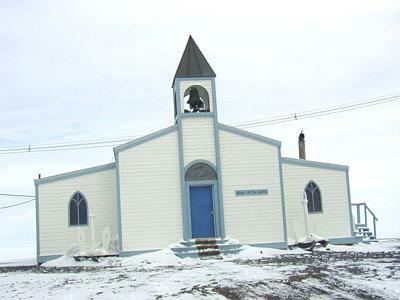 Fire claimed the building in 1978, and it was more than ten years before McMurdo folks had a new Chapel of the Snows, built on a knoll overlooking McMurdo Sound and the nearby mountains and glaciers. 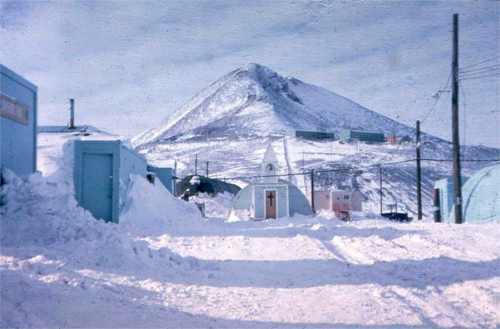 US Navy chaplains began serving Antarctic personnel in 1955. Today Catholic chaplaincy is coordinated by the Diocese of Christchurch, New Zealand. Catholic chaplains are assigned for about a month each during that October to February stretch. 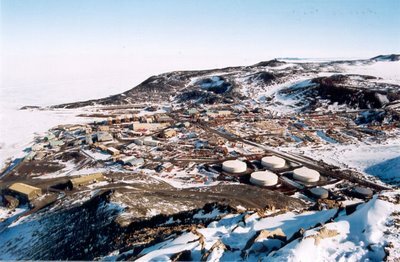 A small contingent of personnel remains to winter at McMurdo. These folks are served by lay ministers trained by the chaplains to lead celebrations of the Liturgy of the Word. While Harrison is on duty, he will preside at daily Mass for a mostly American congregation. "They come here from a huge diversity of areas, from whole different cultural backgrounds and different styles of parishes," Harrison says. "But their unity comes in Christ." He also leads Bible studies and counsels people who sometimes struggle to live and work far from family and home in this remote place. Some people have begun a journey of initiation with Harrison and continue in RCIA once they return home. 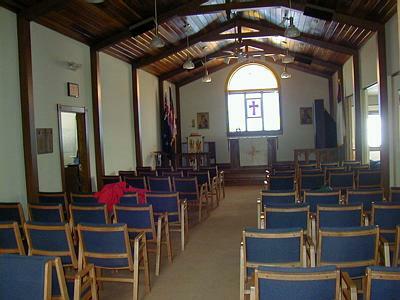 Here's the chapel interior, if you're curious. McMurdo chaplains each take a flight of 840 miles to the South Pole Station to check in on the much smaller base set up there. 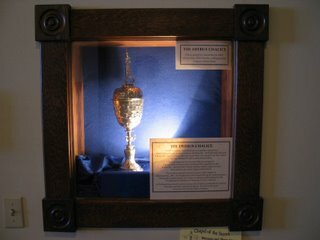 One historic artifact of interest is the Erebus Chalice, carried on the HMS Erebus' 1841 expedition to the continent. Each summer, it is returned to McMurdo for display, returning to spend New Zealand winters on display in the Christ Church Cathedral in Christchurch. 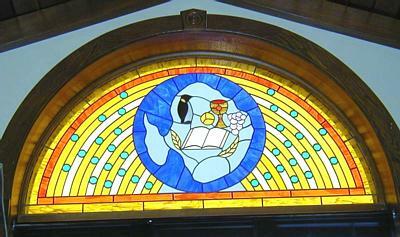 Did you notice that penguin in the stained glass at the top of the post? Hmmm ... any language. Good thinking. 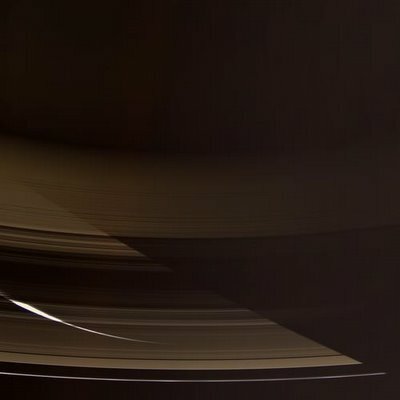 A good amount of ring posts on this week's Cassini site, including this image showing those ghostly "spokes" aligned ad siderum. Voyager 1 first spotted the spokes on its 1980 flyby of Saturn. Scientists were completely clueless, as the spokes appeared to violate the laws of physics. Today we suspect they are some interaction between Saturn's magnetic field and superfine particles in the rings. The particles are elevated above the plane of the rings and align with magnetic field lines created by the planet. St Seraphim of Sarov I meant to write something for All Saints' Day. Then, since time was short, I intended to post an excerpt (here, in any case, is an excerpt from a Theological Studies article on the saints and intercession that I put up last year). But, of course, I didn't have the time to do anything at all. 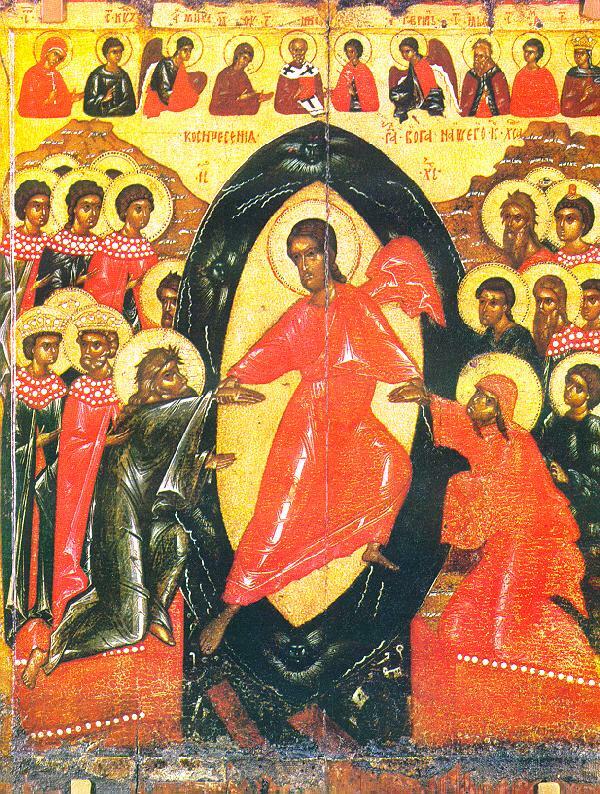 I only have a few minutes today, so I would like to draw your attention to a 2002 book by Michael Plekon, an Orthodox priest and professor of sociology at Baruch College, entitled Living Icons: Persons of Faith in the Eastern Church. Fr Plekon reminds us of Tertullian's claim, Solus christianus, nullus christianus. He then goes on to say - The one who thinks he or she can alone be saved is deluded. We are saved together with the rest of our brothers and sisters in the faith, our fellow saints. It is only in our sin and its condemnation that each of us is alone and makes a choice to cut ourselves off from "the One who is the very source of life. Fr Plekon's book is perhaps most valuable for his accounts of recent figures such as Frs Alexander Schmemann, John Meyendorff, and Alexander Men. But I would like to excerpt part of an earlier chapter on St Seraphim of Sarov that came to my mind yesterday evening. In the paragraph immediately before this excerpt, Fr Plekon explains how Seraphim retreated to a hermitage a few miles from his monastery in 1794. There he prayed, read through the Gospels, and kept a vegetable garden. According to a popular lithograph, he shared his bread with a very large black bear. He was also injured by three robbers (there is no escape from evil). Fr Plekon then tells us how Seraphim challenges our "stereotypes of what holiness looks like": In spring 1810 the monastery's ruling council and new abbot ordered him to return to community life. This he did, but his manner of living the common life was once again a break from the ordinary. He became a solitary within his cell, in the midst of the monastery buildings, venturing out only at night to the church; his meals and even Holy Communion were brought to him. He communicated with no one and was not seen except at a distance on his evening walks. This isolation was extreme even for monastic life. Just as suddenly, in summer 1815, after the local bishop's futile attempt to visit him, he opened the door of his cell to a young couple, the local governor and his wife. From that day until his death on January 1, 1832, his door was constantly open, his life transformed into a nonstop ministry of counseling, prayer, and healing for thousands of people who flocked to Sarov - Orthodox Christians and non-Orthodox from all over the country. But even here there were unusual elements. His monastic cell was filled with candles lit as prayers for many who visited and wrote to him. He dispensed pieces of blessed bread, almost a reenactment of the Lord's feeding of the crowds by the multiplication of the loaves and fishes, a vivid testimony to the "bread of life" of the Eucharist, as [Paul] Evdokimov observes. Seraphim seemed to straddle modern times and the ancient days of the desert fathers. Seraphim appears to have discerned the complex psychosomatic causes of the sicknesses of Michael Manturov and Nicholas Motovilov, both of whom became his close friends and his assistants. He proceeded to heal both of them only after a therapeutic dialogue in which he evoked, or better, provoked, from them a confession of faith in the power of God to heal their diseases. Motivilov, who later would be the confidant of a theophanic revelation with Seraphim, was commanded by Seraphim to stand on his paralyzed legs and walk. In a kind of spiritual psychotherapy, Seraphim cut through all the denials and defense mechanisms of these two, insisting, though, that he was but an instrument, a medium through which the healing power of God was revealed at work in their sufferings. As in the Gospels, having been healed, Manturov and Motovilov were quickly put to work by Seraphim, who had a healthy sense of the sacredness of labor. They became coworkers in many aspects of Seraphim's ministry, taking charge of building a mill and the churches of the Diveyevo convent. With many others who came to him suffering either from physical diseases or from a wide range of emotional disturbances such as depression, guilt, or delusion, Seraphim displayed a marvelous gift of discernment. He could very quickly "read" through the accounts the suffering person presented, finding the deeper roots of their maladies and inviting them to face them to be forgiven and thus healed by God. Even when people were unable or unwilling to tell him their troubles, he could see within their hearts and relate to their situations without their uttering a word. 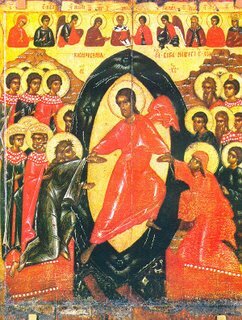 A monk visiting and observing this was amazed and recorded Seraphim's gift of discernment of souls. Throughout the years of his ministry to the suffering, Seraphim never stopped his ministry of prayer. Regularly visitors would have to wait hours and occasionally a day or more until Seraphim opened the door of his cell after a marathon of intercession. ... ... Healed miraculously by the Mother of God in his childhood, the recipient of numerous visits by her and other saints, the seer of visions of Christ at the liturgy, St Seraphim at first appears to conform quite neatly to the category of monastic saint. But on closer inspection, the categories of priest, monastic ascetic, even staretz, or spiritual father, are all transcended and transformed. Though he never left the monastic life, he became a hermit, a mystic, a recluse, and the target of much misunderstanding, hostility, and abuse by members of his own monastic community. Then his interior transformation became visible. The door of his cell was open to all, and every day many visited for his blessing, for his counsel, for the pieces of blessed bread he offered. He listened, counseled them, gave them holy water, and anointed and laid his hands on them in blessing. Although still a monastic, he no longer wore the formal habit but a simple peasant smock and bark shoes. His isolation from others ended, he belonged to the world. Through him the monastery opened to the world, a prefiguring of the wonderful openness of the monks of the Optina monastery to so many, including Dostoyevsky. Though still a priest, no special treatment was demanded, and he communed with everyone else at the monastery's liturgy. Although he was rooted in the customs of the Russian Church and monastic life, St Seraphim was a model of holiness, a living icon in his own time, who extends the possibility of communion in the Lord to every person in every situation in society. Any prestige accruing from status, ordained or monastic, is obliterated. Also demolished are any stereotypes of what holiness looks like, of what ascetic practices are necessary. He fasts, reads the daily offices, attends the services in the monastery church and receives communion, and lights so many candles before his icon that the monks fear he will burn down the monastery. He keeps all the rules. Yet his life and his words make it clear that these are but means to an end and never an end in themselves. When one has recognized the Holy Spirit, one ceases to say prayers or keep the rules, for the Spirit takes over making all of one's life prayer. "Acquiring the Holy Spirit," he said, "is the whole point of the Christian life," and "if one is saved," becomes holy, "thousands around will also be saved." These are the most quoted of all St Seraphim's words, and they contain his amazing openness to God and to all people. St Seraphim welcomed everyone, clergy and law, married or monastic, wealthy or poor. Each person was his "joy," every being illumined by the Spirit and the Risen Christ. Our bishop gets a prominent editorial in today's Star. It's an appeal to the thinking voter. After a rough campaign season, I don't know how many citizens are thinking as opposed to reacting, but it's a game try, nonetheless. Now we get to some of the principles laid down for actual liturgical reform in this subsection of chapter 1, entitled, "The Reform of the Sacred Liturgy." In order that the Christian people may more certainly derive an abundance of graces from the sacred liturgy, holy Mother Church desires to undertake with great care a general restoration of the liturgy itself. This is a clear start that tells us two important things. The council bishops wish that believers would derive more spiritual benefit from the liturgy. To achieve that goal, a "restoration" is deemed as necessary. For the liturgy is made up of immutable elements divinely instituted, and of elements subject to change. These not only may but ought to be changed with the passage of time if they have suffered from the intrusion of anything out of harmony with the inner nature of the liturgy or have become unsuited to it. For many, this is the tricky point. Many elements "subject to change" might well be the object of deep attachment, or even theological significance or truth, but do they belong in the Mass? This section also suggests that what may have been right or important once for the Christian believer, might come to no longer be so. So the community, their needs, and the goal of their participation is the measure of judgment for changeable items. Wherefore the sacred Council establishes the following general norms: And these norms will follow in later posts. By my count, this is the fourth reference thus far to active participation by the assembly. We have yet to hit organic development, to cite one popular revisionist theme, in the body of the text. Thoughts? Reading about the emerging media in Vatican II is always interesting. Here, the council bishops acknowledge television as a media force, but they acknowledge the bishop may not be the most competent to make judgments. Transmissions of the sacred rites by radio and television shall be done with discretion and dignity, under the leadership and direction of a suitable person appointed for this office by the bishops. This is especially important when the service to be broadcast is the <?xml:namespace prefix = st1 />Mass. Do you think this "suitable person" was foreseen to be a regional or national person? Would the bishops have thought the day was near when every diocese might need such an individual? 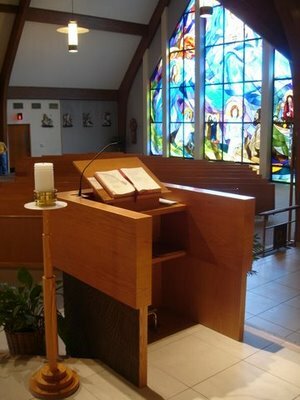 Tonight's post describes the role of the pastor, including yet another mention of active participation: With zeal and patience, pastors of souls must promote the liturgical instruction of the faithful, and also their active participation in the liturgy both internally and externally, taking into account their age and condition, their way of life, and standard of religious culture. By so doing, pastors will be fulfilling one of the chief duties of a faithful dispenser of the mysteries of God; and in this matter they must lead their flock not only in word but also by example. Leading by example. One of the highest compliments I've heard parishioners give about a priest is the prayerful way he prays the Mass. My current pastor is an absolute gem in that regard. He listens to the readings others are proclaiming. He sings. His clear focus during the Eucharistic Prayer is evident. Anybody with outstanding examples of clerical example? All Saints’ Day is a good time to remember that while most saints led lives of quiet service, some led the life of the noisy prophet, speaking the truth to power — even when that power was within the church. Sisters with spines: what a thought! Maybe Mother Guerin will be a patron of sorts for VOTF. Read it, then discuss the two things priests are called to do. Priests, both secular and religious, who are already working in the Lord's vineyard are to be helped by every suitable means to understand ever more fully what it is that they are doing when they perform sacred rites; they are to be aided to live the liturgical life and to share it with the faithful entrusted to their care. 1. Deepening their understanding of what they do--that's a tall order. It implies that a substantial part of a diocese's or order's continuing education of its clergy should focus on liturgy. 2. That sharing of the liturgical life with the faithful includes Liturgy of the Hours, wouldn't you say? Any priests out there with comments on how they are helped or hindered in following through on SC 18? Or lay people with bad or especially good examples of clergy they know? I've avoided it in a lot more places than I did it, but I still think it's a good idea: an annual check-up with each choir member. A director should track the ranges of the singers, getting a sense of where they can sing and how well. You can talk to your chorister about voice care: keeping hydrated, warming up on the way to Mass, things like that. I'd recommend talking about their favorite musical pieces. Ask people what they like to sing. Ask them about your own directing/conducting skills: when do they find you easy or hard to follow? If you have a forty-voice choir, that might mean 10-15 minutes each for a yearly visit. It seems like time well spent. Needless to say, I'm not a fan of auditions for parish choirs, generally speaking. That's not to say some people won't need to be helped to discern another arena for their talents. More on liturgical formation: In seminaries and houses of religious, clerics shall be given a liturgical formation in their spiritual life. For this they will need proper direction, so that they may be able to understand the sacred rites and take part in them wholeheartedly; and they will also need personally to celebrate the sacred mysteries, as well as popular devotions which are imbued with the spirit of the liturgy. In addition they must learn how to observe the liturgical laws, so that life in seminaries and houses of religious may be thoroughly influenced by the spirit of the liturgy. "Liturgical formation in their spiritual life." What exactly does that mean, would you say? Discipline and Spontaneity I learned from Whispers in the Loggia that, yesterday, the Trappist community of Mepkin Abbey elected Dom Stanislaus Gomula as the new abbot. Keep him in your prayers. The community's previous abbot, Dom Francis Kline, passed away in August. I posted a couple times from Francis Kline's writings after his death - here and here - and perhaps I should do so once more. 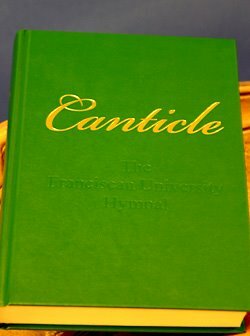 In September of 2001, a conference met at Our Lady of Grace Monastery in Beach Grove, Indiana, to discuss the recently published Benedict's Dharma: Buddhists Reflect on the Rule of St Benedict. Dom Francis Kline delivered a talk on the relationship of discipline and spontaneity, a theme of the book. In our own lives, I think that we tend to oppose discipline and spontaneity. We cling to the sure rigidity of discipline when we find ourselves disturbed by the vagaries of either the circumstances in which we find ourselves or our own subjectivities. Then - perhaps soon after - we grasp for spontaneity against the unbearable constriction of discipline. Francis Kline reminds us that "discipline itself prepares for surprise," and that we cannot encounter any real spontaneity until we have been prepared for it by discipline. Discipline and spontaneity go together. Kline noted that the word "spontaneity" was not often used in Western monastic literature. After his talk, Roger Corless, a professor at Duke who was one of the founders of the Society for Buddhist-Christian Studies, noted that one can find a great deal of "spontaneity" in the idiorhythmic tradition of Eastern Christianity. I'm not sure about contemporary application of this tradition (please feel free to enlighten me), but I'll include an excerpt from Dr Corless after an excerpt from Dom Francis Kline: Another perspective, and I was very edified to see this in the book, is the experience of spontaneity within discipline. They’re really not opposed, as we all know. It’s unthinkable to have a kind of discipline that gets rigid to the point where we’re not alive to the things that are going on around us, and that’s exactly what Judith says: “We find in our practice a kind of natural discipline.” I’m interested in the definition of the word “natural,” even when she gets to the next page and talks about a “sacred character” to discipline. Because, in the Benedictine and Cistercian perspective, the idea of spontaneity is the liberation, I think, that we find at the end of Chapter 7 on humility: this total transformation experience, that what was a rule, what was counter to what we wanted to do, becomes natural, becomes so much a part of us that the love of virtue, the love of Christ, becomes who we are. Then discipline takes on a new meaning. But the word spontaneity is not used so much, as far as I know, in the Christian West, in monastic circles. I’m sure you can find it in places—but what I think it’s pointing to is the surprise in life, how flexible we can be in the face of situations that are bound to come up all the time. Here art may help us, because you never have a total surprise or something that’s totally spontaneous in true and great art. I mean, you do have it, but the one who is surprised is not the viewer or the listener so much as the one who’s creating the work. The discipline itself prepares for surprise. The Rule itself gives rise to something greater than itself, if we’re being honest and true to the practice. I point to Jesus’ parable of the Good Samaritan. The priest and the Levite were not able to be spontaneously compassionate. Perhaps they didn’t have the kind of preparation that was necessary to jump cultural boundaries, to be Jews and take care of whoever was injured in the pit. But the Samaritan, who wasn’t supposed to be generous to whoever was in the pit or suffering from the robber’s wounds, was the person who jumped all of these rigid rules and went to help the individual. And not only was he generous, but he was generous to an exaggerated degree—yet his generosity was not inappropriate, it was not unfitting, and I think that’s what I’m trying to say about this view of discipline and spontaneity. No matter how much of a surprise things may be and no matter how spontaneous they are, they’re still prepared for somehow, in the outreach that we may make to them. We come prepared to do this, even in mystery. ... Roger Corless: In the remarks we’ve just received from Father Francis, I was struck by his comment that spontaneity is not mentioned that much in the Western tradition. I think he was careful to say the Western tradition. And it struck me that if we were to have monks and nuns of the Eastern Orthodox tradition in this conversation, it would be enriched and different because of the idiorhythmic tradition in the Eastern Orthodox, which seems to have gone out in the West a little bit, though it appears to have been there in St. Benedict’s time. It seems that he lived as an idiorythmic monk, that is one who made up his own schedule rather than receiving it. In what I think is really one of the more amusing stories, he’s off on his own in the wilderness practicing by himself, and a raven comes every day with some bread and that’s all very nice. But one morning, no raven, no bread, and no breakfast. Oh well, that’s the breaks—and then along comes a human with a whole basket of bread, saying, “It’s Easter.” And he didn’t know that, so he wasn’t going to mass, and he wasn’t with the community; he was doing something else on his own. But that tradition seems to have been kept up in Eastern Orthodoxy, where a direct connection with God outside of the sacramental system is still regarded as something worthwhile and often made by people who are not priests—of course, St. Benedict was never a priest. He knew some priests, apparently, and wasn’t too impressed with them [laughter]. So I certainly don’t regret that in the book there is no mention of Eastern Orthodox Christians. The book is rich enough as it is, and it is helpful that it has the focus on the Rule of St. Benedict; it doesn’t get too broad. But I would like to ask that as we continue this conversation we find some way to bring in the brothers and sisters of the Eastern Orthodox tradition. 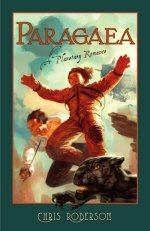 After some heavy European history earlier this month, I had some fun this past weekend with Chris Roberson's Paragaea, reviewed here. I was reading the history mainly to get a sense of the Church's role in the Great War. I learned that the French almost pitched away victory because of their cultural anti-Catholicism. I read of how military leaders were snail-slow to take advantage of the advances in military technology, and how they continued to throw soldiers into harm's way simply by conducting a 20th century war with their brains (if not butts) in the Napoleonic Era. It made me wonder about Iraq even more. Talking with some colleagues over the past several days. You know: real world colleagues who have to deal with liturgy in parishes, some of whom are even priests. One friend had an interesting take on the end of the lay purification indult: it's not the pope; it's Arinze. On the Kansas City front, there's nothing afoot on implementation yet. 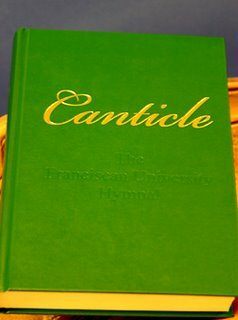 But I did hear from a friend about a conservative pastor who wants to install Canticle: The Franciscan University Hymnal in his parish. The hardcover hymnal, which is used daily in Christ the King Chapel, consists of a comprehensive selection of music styles including traditional hymnody and contemporary songs, as well as Gregorian chant and praise and worship songs. I looked at it for about five minutes today. Lots of praise and worship songs. Lots. Five Mass settings by Jim Cowan. Only two by Marty Haugen. Some plainsong, but probably more bits from GIA's contemporary psalms. A good quantity of hymns with "questionable" theology, as they say. I'd be curious to know what my reform2 friends think of this. Or anybody else. What do you think, liebchens? Good idea? Necessary idea? Pastoral disaster? I'll weigh in tomorrow with my opinion. Here's the latest full color image from Saturn, looking down on the dark side of the rings. The bright sliver on the lower left is the crescent of the day side of the planet. Looks like Blogger has its act together today. Let's see if I can replicate some of last Friday's lost post on moons. 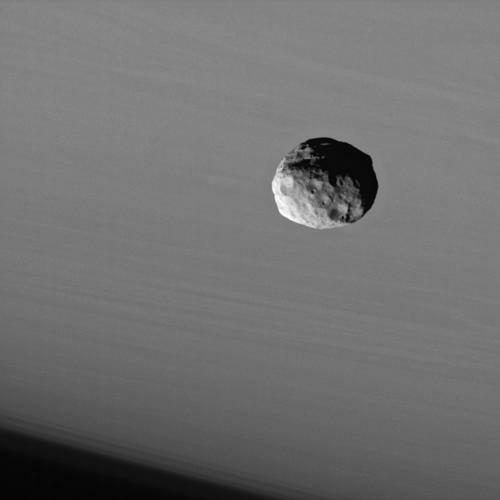 Blogosphere, meet Janus: Janus is one of Saturn's relatively small shepherd moons. Janus is 113 miles across--about the size and shape of Connecticut and Rhode Island put together. 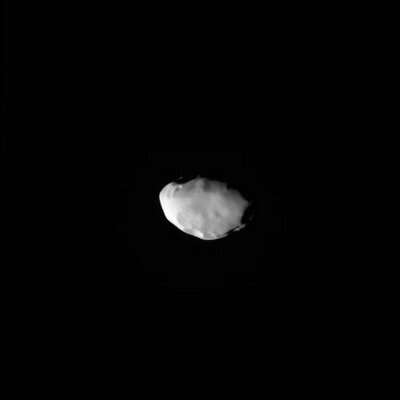 Old tiney space artists (as well as George Lucas) assumed that these small moons would be craggy, rocky bits. Yet the truth is not so. 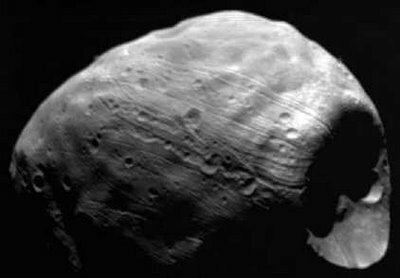 Check out this gallery of solar system moons ... First Telesto: And Mars' moon Phobos: These babies have craters, yes, but their contours are surprisingly rounded compared to what we thought we'd find in space. It turns out that we have erosion in space: radiation from the sun, solar wind particles, and the like. There's also a presumption that there are fine grains of dust covering these small bodies. 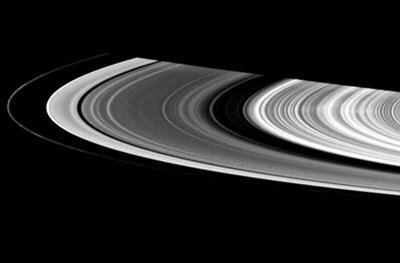 Dust made of ice, as in the case at Saturn. Dust made of teeny particles of stone, as in the case at Phobos and our own moon. Static electricity is also a space event. Scientists are a bit worried about the possible effects of electric charge when astronauts go exploring. Will computers freak out? I blogged on this a few months ago, but all this dust in space is potentially hazardous to space travellers if it gets in their machinery, or especially, their lungs, where it can asphyxiate in minutes if it gets dragged back into the crew compartment. Anyway, that's decades in the future. For now, enjoy the pretty pictures. More on the study of liturgy: The study of sacred liturgy is to be ranked among the compulsory and major courses in seminaries and religions houses of studies; in theological faculties it is to rank among the principal courses. It is to be taught under its theological, historical, spiritual, pastoral, and juridical aspects. In other words, everything. Let me ask priest readers: were all five aspects covered in your seminary training? I would like to say that my training probably lacked something of the spiritual and a bit of the juridical. History and theology were heavily emphasized in my courses, but I also confess I don't have a liturgy degree. Moreover, other professors, while striving to expound the mystery of Christ and the history of salvation from the angle proper to each of their own subjects, must nevertheless do so in a way which will clearly bring out the connection between their subjects and the liturgy, as also the unity which underlies all priestly training. This consideration is especially important for professors of dogmatic, spiritual, and pastoral theology and for those of holy scripture. In other words, professors in these disciplines must see how their academic specialty relates to liturgy. Again I ask clergy readers: was this true? Any other comments? Short and sweet. Enjoy it; we don't get too many in the Vatican II department: Professors who are appointed to teach liturgy in seminaries, religious houses of study, and theological faculties must be properly trained for their work in institutes which specialize in this subject. In other words, a Roman collar is insufficient.